A midcentury recreation of the exceptional conditions of 2012-2017. A midcentury drought scenario is developed that mimics the dynamical character of the 2012-2016 record-breaking drought period in California. The midcentury drought is analyzed in light of changes to temperatures, precipitation, snowpack, soil moisture, evapotranspiration, and forest health. The intensity of the California drought of 2012-2016 was sufficiently severe to have led to sweeping legislative changes aimed at maintaining water resource availability across the state. However, warmer atmospheric temperatures promise to exacerbate the impacts of the next severe drought period. Our analysis suggests that under identical dynamical conditions, a drought in the 2042-2046 period would be associated with more extreme temperature days and an increase in the seasonality of precipitation, with wetter winters and drier summers. Loss of snowpack as a result of higher temperatures would remove an important buffer on soil moisture in the Sierra Nevada mountains, with pronounced consequences for forest mortality. The California drought of 2012-2016 was a record-breaking event with extensive social, political, and economic repercussions. The impacts were widespread and exposed the difficulty in preparing for the effects of prolonged dry conditions. Although the lessons from this drought drove changes to state law and policy, there is little doubt that climate change will only exacerbate future droughts. To understand the character of future drought, this paper examines this recent drought period retrospectively and prospectively; that is, as it occurred historically, and if similar dynamical conditions to the historical period were to arise 30 years later (2042-2046) subject to the effects of climate change. Simulations were conducted using the Weather Research and Forecasting (WRF) model using the pseudo-global warming method. The simulated historical and future droughts are contrasted in terms of temperature, precipitation, snowpack, soil moisture, evapotranspiration, and forest health. Overall, the midcentury drought is observed to be significantly worse than the historical period, with many more extreme heat days, record-low snowpack, increased soil drying, and record-high forest mortality. 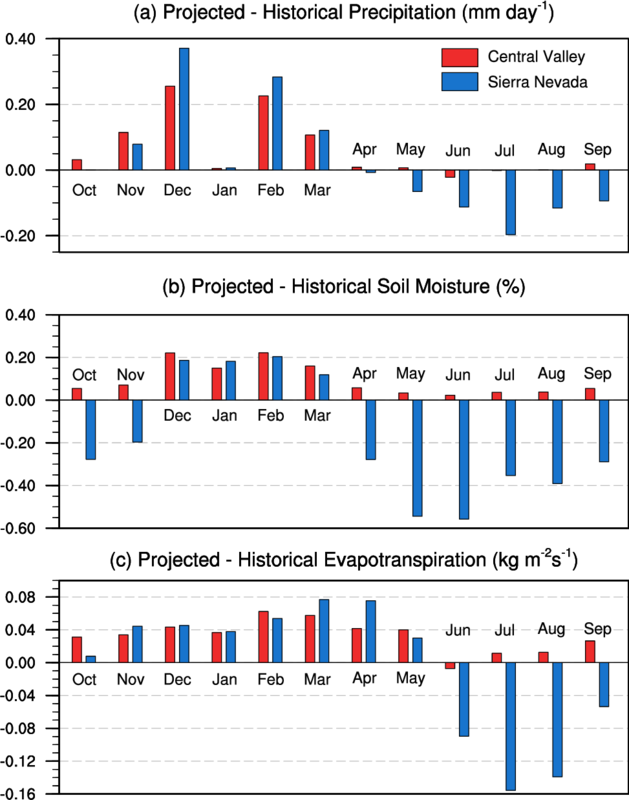 With these findings in mind, the datasets developed in this study provide a means to structure future drought planning around a drought scenario that is realistic and modeled after a memorable historical analog. Ullrich, PA, Z Xu, AR Rhoades, MD Dettinger, JF Mount, AD Jones, and P Ullrich. 2018. "California's Drought of the Future: A Midcentury Recreation of the Exceptional Conditions of 2012-2017." Earth's Future, doi:10.1029/2018ef001007.